Fantastic photos of the kids. They are all so cute. Thanks for sharing Beth. CONGRATULATIONS!!! Kylie SMS'd me and told me the awesome news....Beth she is just gorgeous. If I had've know you were going I would've stayed!! Read your post and just stopped by to say "hi". And congrats. Your family is lovely. 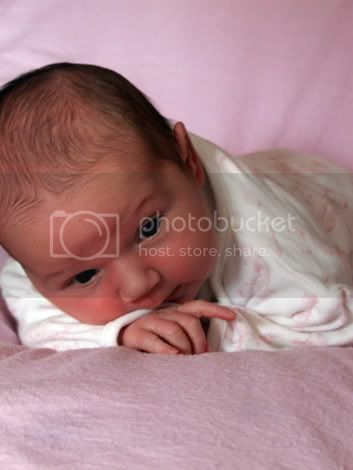 those photos are gorgeous, still takes me forever to try and put our pram up, know who doesn't use it much hey. How beautiful are those pics!!??!! LOL!!! But where would you be without your pram??!! Amy is so gorgeous!! ( and Luke , too!! How sweet!! ) . What on earth was written on your box? Congratulations on Amy's safe arrival. She is gorgeous and I love the car photo. What an adorable photo of Amy!!! Love it!!! And bummer about the box writing (details required!!!). I don't trust a lot of SM's judgement anyway. I think you are brilliant and you are one of my most favourite ever scrappers! Love the photos! And the pram story. I think I had issues like that too, since it was so long between using it! Congratulations on the birth of Amy!! She is sooo adorable! Makes me clucky just looking at her. Good luck for Masters too :) It is such an awful wait to find out, hope you get there. 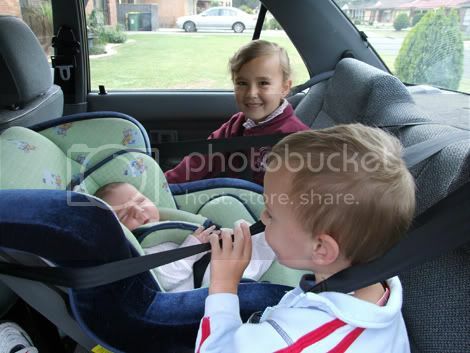 well done on the getting-the-kids-into-the-car-thing! and on the pram too!